Had a week here, late October, and we were the only ones on the site. Friendly welcome from the owners, plenty of room, lovely autumnal feeling with all the trees changing colour and shedding their leaves. Only one tiny complaint - grass was a bit long and, with the cold nights, it was very wet in the mornings. But our two dogs loved it so all was well. One of the best CLs we have stayed on: very large, flat, many trees for shade but open, cut-grass areas as well, very quiet, easy access, friendly and welcoming owners. Could not ask for more. Just home from a superb bank holiday weekend at this site. Very friendly welcome from the owner and his two beautiful black labradors.The site is extremely large for only five caravans, so plenty of room to spread out and for children to run around. A very peaceful site and will definatly be returning. 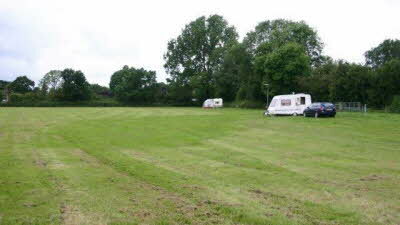 Large well kept very private pitches..off a quiet lane. Grass and surrounds are kept to a high standard..not much around to visit, but such a nice peaceful site to relax and enjoy the countryside.